Jody Sperling is a dancer, choreographer and dance scholar. She is the founder and Artistic Director of Time Lapse Dance. This is Jody's blog. Never after reading a book have I felt such an upsurge of gratitude to an author as when I finished Carolyn Brown’s Chance and Circumstance: Twenty Years with Cage and Cunningham (Alfred Knopf, 2007). 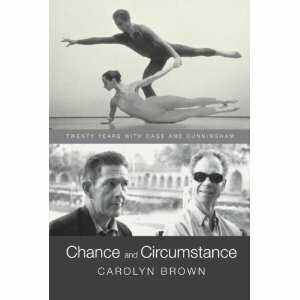 This volume, which chronicles Brown’s twenty-year career as a dancer with Merce Cunningham’s dance company took her thirty years to write. Brown depicts herself as a conscientious, perfectionist type of dancer who struggled over the years to move large. As a writer she displays the same meticulous tendencies. Both as performer and as writer, however, her extraordinary attention to detail helps reveal a passionate devotion to the material. We are lucky that Brown kept a journal and was a prolific letter writer throughout her performing career. She recounts every major Cunningham performance and tour, from the birth of the company at Black Mountain College in 1953 until her last appearance in 1972 at the Théâtre de la Ville in Paris. You feel like you were there, hearing about the splintery raked floors, the exhausting travel conditions, the endless rehearsals, the sometimes uproarious sometimes adulatory audience response. But most marvelously told is the experience of what it was like to dance Merce’s works, so many of them, and on so many different stages all over the world. The narrative begins with Brown and her then-husband composer Earle Brown moving to New York in the early 1950s and being swept up in Cage and Cunningham’s artistic circles. A vivid view of a city’s bygone era emerges, a time of grit, possibility and boundless energy. Brown expresses the most nostalgia for the company’s early touring years when, with Cage at the wheel of a VW microbus, life and art intertwined. Road trips included jaunts for mushroom picking and company cook-outs. Cage leaps off these pages as an uncommonly generous, affable, kind man, not without flaws, but fiercely devoted to Cunningham and a tireless promoter of the company. Added to our picture of Merce, the emotionally elusive, brilliant and prolific choreographer, is Merce-the-dancer who thrived on performing. He didn’t miss a single one of the seventy performances scheduled on the grueling 1964 world tour despite a serious illness and injuries. Brown shows us how he ate up the stage at every opportunity with dramatic intensity. She also suggests that, contrary to the oft-stated notion that Cunningham’s dances didn’t have meaning aside from the movement itself, some of his dances did have stories, even if he never shared these with the dancers. The book also traces Robert Rauschenberg’s ascension from poverty to celebrity. For a period, Rauschenberg (who was already becoming famous) toured as the company’s scenic designer and stage manager, sweeping floors, composing the lights and building ingenious custom-designed sets from scratch in each new locale. Perhaps the meatiest part of Brown’s book is her description of how the collaboration between Cage/Cunningham and Rauschenberg was torn apart by his runaway success. Brown sheds light on the inter-personal dynamics of these three extraordinary artists without ever resorting to gossip. If there’s a flaw in the book it’s in exhaustiveness. At 600 pages (according to Brown’s acknowledgments cut down from 900!) this is more chronology than most lay readers would want. However, as a resource for the scholar or Cunningham fan, this is a treasure trove. Personally, I enjoyed every page and finished it with a lump in my throat. Thank you, Carolyn Brown, thank you! Copyright © 2009 Jody Sperling - Time Lapse Dance. All Rights Reserved.